The #1 shopping app on iOS and Android in the US is not Amazon. It’s Wish.com. How did this startup founded in 2011 become the leading mobile e-commerce platform in North America and Europe? Using data and analytics, powered by Treasure Data from Day 1. Wish.com knew they had to focus on personalization because of their focus on mobile. They saw retail shifting from brick and mortar to e-commerce, and e-commerce shifting from desktop to mobile, and set out to transform mobile devices into handheld shopping malls. What does this mean? It means that mobile shopping is navigational. Shoppers are browsing, not searching with the intent to buy. In fact, 9 out of 10 mobile purchases on Wish.com are navigational and do not begin with a search query. Mobile shoppers do not know the exact brand or item they are looking for. It is up to Wish.com to figure that out and guide shoppers to their purchases. How? By providing accurate, personalized feeds and product recommendations. To deliver the most relevant results to shoppers, Wish.com uses customer behavior data, such as the products a shopper has liked or rejected in the past, and analytics, such as state of the art recommendation technology based on continuous A/B testing. This is no small feat. There are over 70 million SKUs for shoppers to choose from and Wish.com tries to ensure that 95% of products that cross the consumer’s field of vision are somewhat relevant. To do this right, Wish.com needed to capture data. All of it, in real-time or as soon as it’s available. As former Yahoo!, Google, and Facebook engineers, the founders knew the intricacies of owning data infrastructure at this scale. Given the size and priorities of their team, they knew they shouldn’t get involved with maintenance and support. They needed a completely plug-and-play customer data platform: Treasure Data. 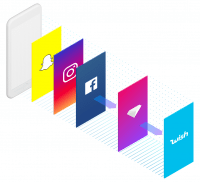 With access to all their data on-demand, Wish.com created a relevant, entertaining and personalized shopping experience for each individual consumer, doubling conversion rates YOY continuously. 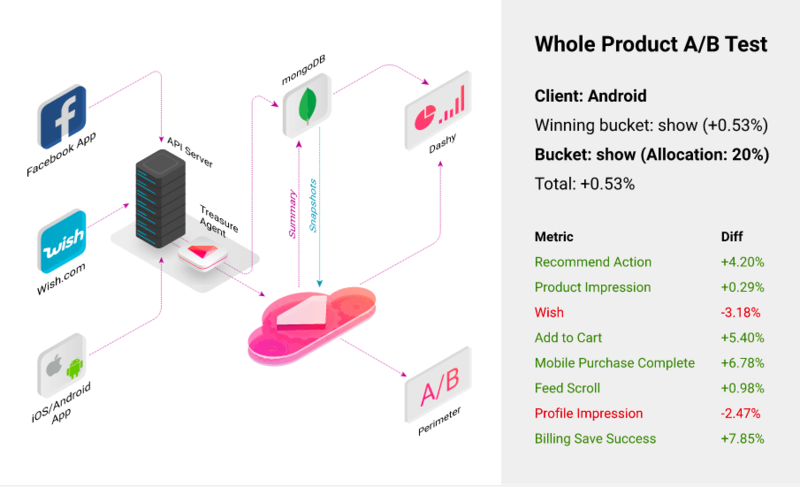 With a few simple queries through Treasure Data’s API, Wish.com built their own tag-based A/B testing framework and began monitoring changes in customer behavior. 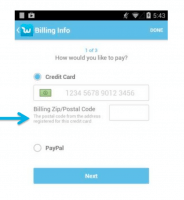 It turns out, mobile purchases completed increased 7% for customers shown the additional explanatory sentence. The team’s hypothesis was correct, and they updated their billing page. 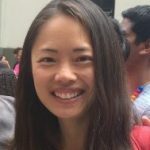 Treasure Data’s analytics platform allowed Wish.com to quickly test and validate their hypothesis. With just 15 minutes of work, sales were boosted by 7% – talk about frictionless revenue growth! But data isn’t there just to confirm hypotheses. 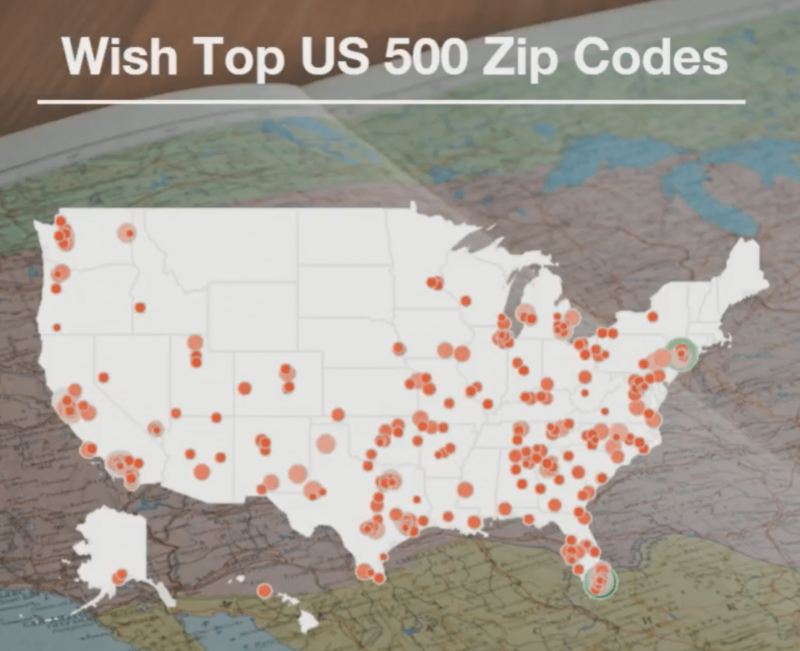 When Wish.com looked at the distribution of sales in the US geographically, they expected the top zip codes by revenue to be near large metro areas like New York, San Francisco and Houston. In reality, the top 500 zip codes were not concentrated around the most dense areas but were well distributed over the entire country. And in Europe, they found top selling locations to be even more spread out. Wish.com now uses Treasure Data to process 10 billion events per day. Developers can easily set up new data streams to feed their machine learning models on the fly. Third party merchants can review every impression on their product listings from a personalized online dashboard. And every Wish.com employee can explore user behavior trends through Dashy, an internal BI visualization tool built on the Treasure Data API. Wish.com is now the top 3 shopping app in over 30 countries worldwide and shipping almost a billion orders annually. Even today, they continue to scale and grow their conversion rates by 65%. And believe it or not, it all began with customer data. Join Wish.com, Fitbit, Warner Brothers, GE, Canon, Toyota, Mattel and other global customers using Treasure Data to scale and grow your business using customer data analytics. Click here to request a demo today. Yuchen is a promoter of big data analytics. She also pioneered the World’s Only Hot Smoothie.